ANCHORAGE—Republican Governor-elect Mike Dunleavy said his campaign promise to return the dividends that were either vetoed or reduced by the Legislature will be in cash and not land as had been rumored in the final days of the election. Dunleavy’s core campaign promise has been to pay dividends under the full statutory amount set before it was altered by the Legislature earlier this year amid the state’s financial woes as well as return the dividends cut in previous years. The amount estimate comes to a roughly $6,700 payout next year. Doubts about the Republican’s plans for the dividend emerged late in the race that ranged from the financial reality of making such a payment (about $4.3 billion to $4.5 billion) to the political reality in a Legislature that had just voluntarily reduced the dividend through legislation (the House Republicans wouldn’t commit to either plan on Wednesday). A last-minute rumor emerged that suggested Dunleavy—who had admitted in the final days of the race that a full PFD might not be doable long-term—would instead seek to offer land in place of part of the repayment. 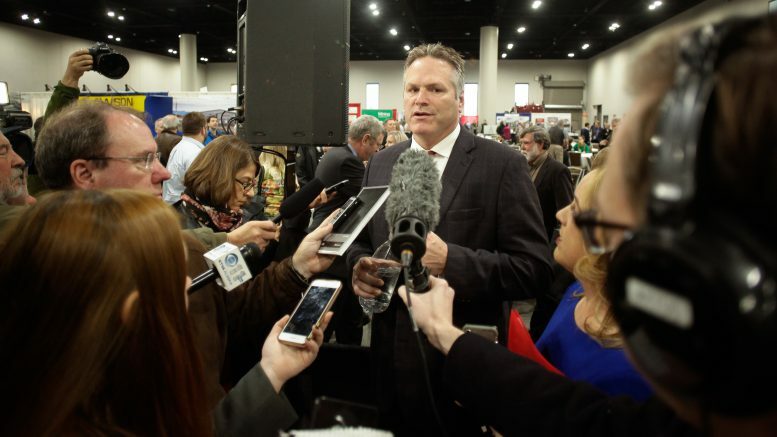 Speaking with reporters after he announced the framework of his transition team at the Alaska Miners Association Conference, Dunleavy said the payment will be in cash but that he is interested in pursuing a project to move public land into private ownership. He said such a program would be separate from the PFD payment. When asked about how he’d go about funding the PFD, he said it would come out of the Alaska Permanent Fund’s $19 billion earnings reserve account, which is one of the state’s last remaining accounts that can be tapped with the approval of a majority of legislators in each chamber. The main purpose of Thursday’s event was Dunleavy’s announcement of the framework of his transition team. He has appointed Alaska Republican Party chair Tuckerman Babcock as the transition team chair and said he will stay on in the administration as his chief of staff. Campaign manager Brett Huber is slated to stay with Dunleavy, serving as a senior policy director for the administration. Mary Ann Pruitt will come on as the transition team’s administrative director, Sarah Erkmann Ward will come on as communications director, Kristie Babcock will come on as scheduling director, Stacey Stone-Semmler will work as legal counsel and Gina Ritacco will serve as the team’s director of boards and commissions. In his first public speech since Democrat Mark Begich conceded the race, Dunleavy thanked the Alaska Miners Association for helping him achieve the victory and said that a top priority will be to usher in new mines. 3 Comments on "Dunleavy says PFD repayment would come as cash, not land as rumored"
That state Supreme Court back Governor Walker’s decision the cut the PFD. The PFD doesn’t belong to state Residense, it belongs to the state of Alaska. Period. If you need more money to blow, go find one or two more jobs and quit your whining. That state Supreme Court backed Governor Walker’s decision to the cut the PFD. The PFD doesn’t belong to the people, it belongs to the state of Alaska. Period. If you need more money to blow, go find one or two more jobs and quit your whining.